- Superior or cranial (cephalic) indicate that a structure is located at a higher level or closer to the head. 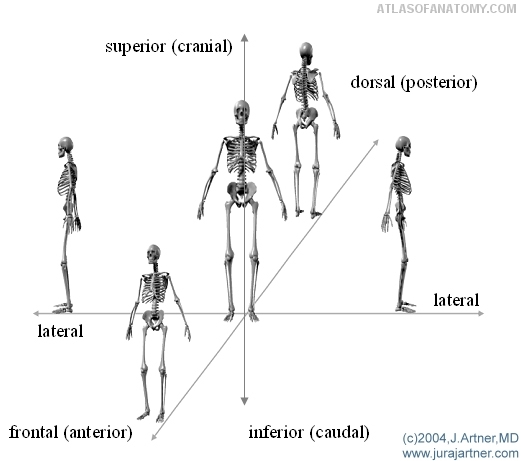 The opposite of these are inferior or caudal, which indicate that a structure is located at a lower level or downwards. In case of the limbs, the terms proximal and distal indicate the level or the relative distance from the attached end of the limb (for example: the arm in standard anatomic position; proximal would mean near to the shoulder; distal would mean further away or located below). - The terms anterior or ventral indicate a relation to the front of the body or of a bone (e.g. anterior surface). The terms posterior or dorsal indicate that a structure is located near to the back of the body. - The terms medial and lateral refer to a position in relation to the medial plane (or the long axis) of the body or of a structure (medial: toward midline; lateral: away from midline or located at the side). - The terms superficial or profundal are used to describe a position or location relative to the surface of areas, structures or tissues. The term superficial indicates that a structure is located close to the surface of a tissue, the term profundal indicates that it is located more deeply. - The terms internal and external describe a structure's position or a view in relation to inner and outer surfaces (for example in organs or cavities). - The term ipsilateral indicates that two structures are located on same side of the body. - The term contralateral indicates the opposite (opposite side of the body).